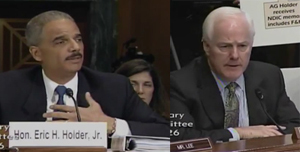 (VIDEO) Cornyn to Holder on Fast & Furious: “Would you like to apologize today for this program that went so wrong?" Today, I pressed U.S. Attorney General Eric Holder for answers on the federal “gun-walking” operation known as “Fast and Furious.” Attorney General Holder claimed he could not “be expected to know” the details of Fast and Furious, refused to apologize for U.S. Border Patrol Agent Brian Terry’s death, and acknowledged that no one has been held accountable over the deadly program. Video and transcripts of the hearing are below.